Sarah Personette is the Chief Operating Officer at Refinery 29. Previously, as Vice President of Facebook’s Global Business Marketing team, Sarah sets the course for how the advertising community can best leverage Facebook’s apps and services in a mobile-first environment. In this role, Sarah is responsible for providing clients with innovative and effective marketing solutions for their businesses. 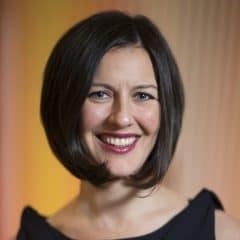 Prior to rejoining Facebook in 2014, Sarah most recently led Universal McCann’s agency operations in the US where, as President of the agency, she oversaw strategy, analytics, custom content, cross- channel buying and planning, and business development. Before joining Universal McCann, Sarah built and led Facebook’s Global Agency team. In addition to partnering with the Agency community in this role, she led the combination of creative and strategic thinking behind turning cross-channel campaigns into those fueled by digital insights. Sarah also has extensive client and category expertise. She served as senior vice president at Starcom Mediavest Group leading the Mars Wrigley AOR, and has deep experience across CPG/FMCG, Beverages, Pharmaceuticals, and Consumer Electronics. Sarah was recently inducted into the American Advertising Federation’s Advertising Hall of Achievement, which recognizes the industry’s top leaders aged 40 and under for their profound impact on the industry. In 2014, Sarah was named one of Advertising Age magazine’s top “40 Under 40” marketing stars. As a part of Sarah’s ongoing commitment to her community and the industry, Sarah is honored to serve on the Boards of AWNY, Northwestern University’s Regional Board, the Reisenbach Foundation, the Angelight Foundation, and the steering committees for the 30% Club and Social Impact for the Ad Council. She is also a Rotary International Paul Harris Fellow. Sarah prides herself on executing with transparency and openness and relentlessly putting customers at the center of her work. Sarah is based in Facebook’s New York office. She holds a degree from Northwestern University and is a very proud wife and mother of two.